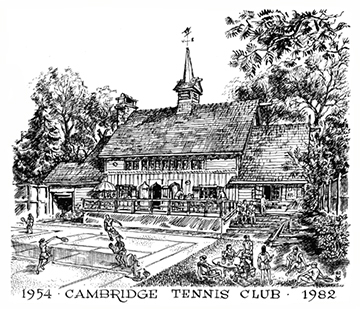 The Cambridge Tennis Club rents space from the Cambridge Skating Club which was founded in 1897-8 on property at the corners of Mt. Auburn and Willard Streets. The space was once known as Mrs. Thorp's Field, who was Annie Longfellow Thorp, a daughter of Henry Wadsworth Longfellow. Winters, the field was flooded and neighborhood folks skated there. Summers, the field was used for community gardening, an arrangement that lasted until soon after World War II when people were exhausted from growing and canning. In the early 1950's, members of the Cambridge Skating Club, most notably Arthur Brooks, then the President of the CSC, enlisted 27 CSC members to contribute money to build tennis courts on the property. The club was incorporated in May, 1954. Arthur Brooks was the President of the new Cambridge Tennis Club from 1955 to 1957. The Tennis Club was originally free to neighbors but soon became so popular that it was organized as a private club, open to residents of Cambridge. The property, owned by the CSC, now hosts a private skating club in the winter and a private tennis club from mid-March to mid-November. The clubhouse was designed by a Cambridge architect, Allen W. Jackson, and built in 1930 when the Skating Club purchased the property. The clubhouse was in a Norwegian style. The interior of the clubhouse is a charming place with wooden benches surrounding the walls, benches much used in the winter for skaters changing in and out of skates. There is a huge fireplace at the end of the building. The fireplace is seldom used during the tennis season, but there is a large deck overlooking the courts and the deck frequently hosts a frolicsome scene. The club is run by an elected, rotating Board of Governors with a full-time staff and three tennis professionals. The membership is active and enthusiastic and organizes round robins, holiday cook-outs, tennis get-together parties, tournaments, and ladders. The club also sports a tournament-level table tennis table and Ping Pong parties. The Cambridge Tennis Club features five excellent Har-Tru courts and a picturesque clubhouse almost surrounded by parks. (Adjacent to the club is Longfellow Park.) The club is a tennis haven nestled in greenery, a sylvan site in the midst of the city of Cambridge. *Much of this information came from Annette LaMond's excellent, comprehensive A History of the Cambridge Skating Club 1897-2001. 1955-1957 • Arthur H. Brooks, Jr.
1965-1967 • Graham B. Blaine, Jr.